Photos provided by Barb Heiss, Charles Hensen, Joe Busam, Ron Chamberlain, Jeff Barnes, Howard and Judy Zimerman, Bruce Tinkel, Tim and Dottie Troutman and Dee Ankers-Denning. 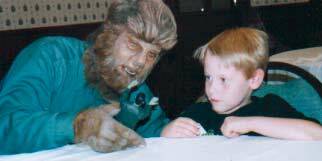 Baron Von Wolfstein makes a wolf of himself with Dee Ankers-Denning. 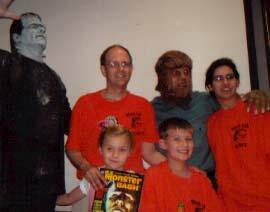 The Adams Family: The Frankenstein Monster, Ron Adams, The Wolf Man, Ursula Adams, Paisley Adams and friend John Adams! 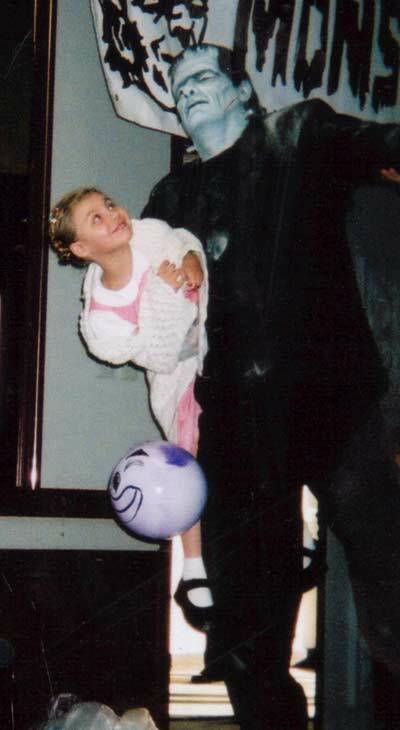 Right out of THE GHOST OF FRANKENSTEIN, the monster rescues the little girl's ball from the rooftop at Monster Bash. 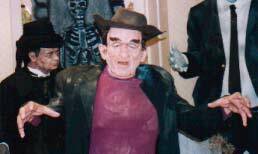 Bill Edwards as Rondo Hatton with face courtesty of Monster Bash Make-Up Artist - Ron Chamberlain. 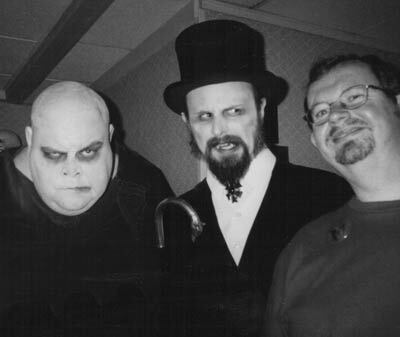 Ygor (Mike Thomas), Rondo (Bill Edwards) and Shawn Chamberlain. 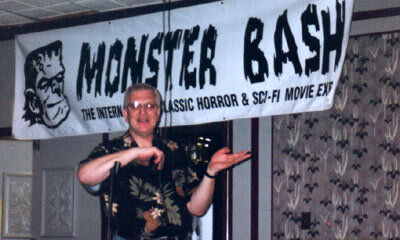 The monsters give Monster Bash monster creator, Ron Chamberlain a make-over! 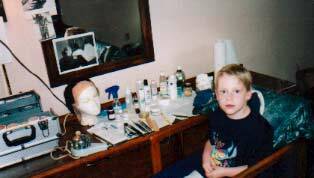 Ron Chamberlain's son Shawn in his dad's magic make-shift studio at Monster Bash. 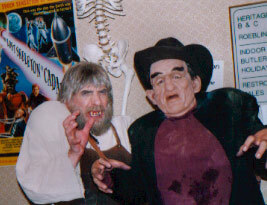 The Wolf Man (Mark Statler) and Shawn Chamberlain play with a Frankrenstein action figure. 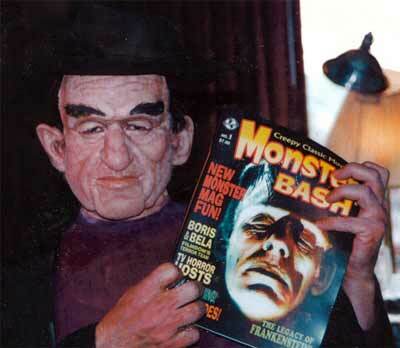 The Creeper proudly displays the premier issue of Monster Bash magazine. 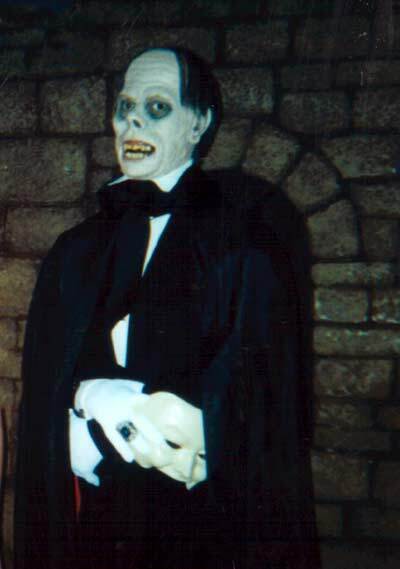 The Phantom shall not die at Monster Bash 2004, courtesy of Cortlandt Hull. 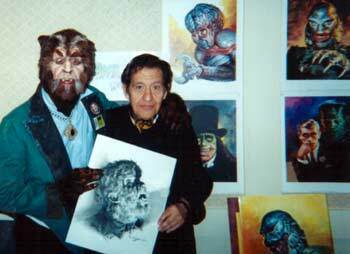 TV Horror Host Baron Von Wolfstein with artist Basil Gogos. 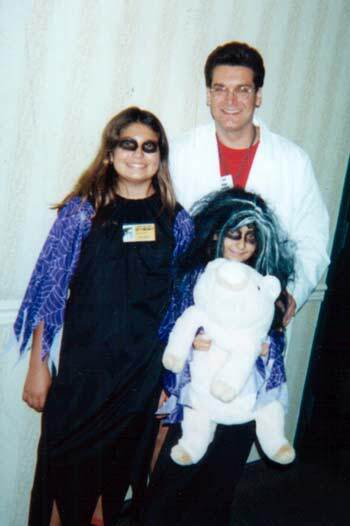 Brian Nichols and his Ghoul Girls - a hit at Monster Bash! 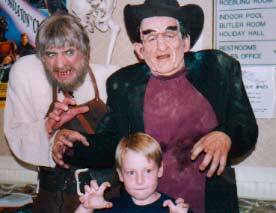 TV personalities from Ghoul A Go-Go Meet Monster Bash staffer Jeff Barnes. 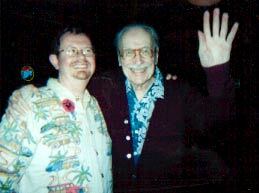 Monster Bash's Jeff Barnes beems with Forrest J Ackerman! 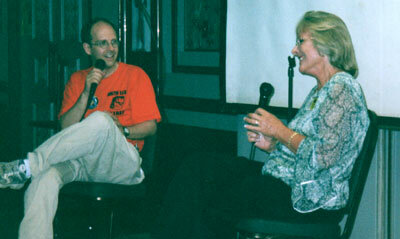 Ron Adams and Dee Ankers-Denning have fun during Dee's Q&A session. A monstrous family! 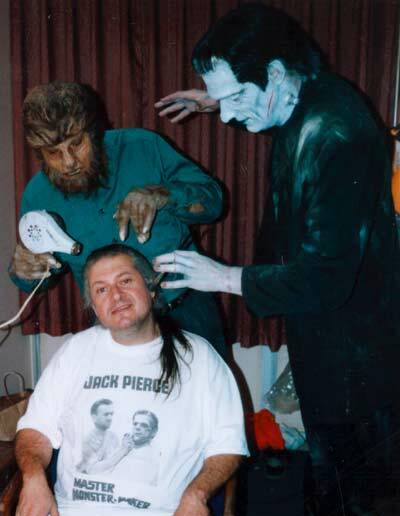 Frankenstein's monster and The Wolf Man help celebrate the unveiling of Monster Bash magazine. Pictured: Todd Speidel (The Undying Monster), Ron Adams, Mark Statler (The Wolf Man), Ursula Adams, Paisley Adams and John Adams (son of Monster Bash's Mike Adams) beems on stage. Forry just arriving at Monster Bash Thursday afternoon and is stunned by the jam-packed lobby with greeters and large signs of "Welcome Forry!" Bruce Tinkel is having a great time at Monster Bash and is always a welcome dealer at Bash! 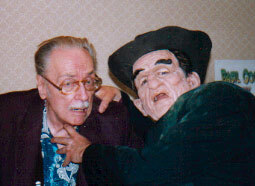 Forrest J Ackerman gets "Acked" by Rondo Hatton (created by make-up master Ron Chamberlain). 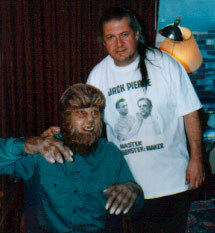 Ron Chamberlain (Monster Bash Make-Up Master) and his creation, The Wolf Man (Mark Statler). 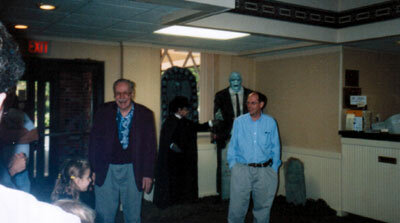 Ghost (of Frankenstein) Host - Ygor with The Creeper. Second Bananas in the movies, Big Bunch 'O' Bananas at Bash. Stunned and amazed at Bash 2004 - It's Vlad and Creighton making balloon animals (snakes, worms, eels...Crieghton needs it simple!) for the kids. 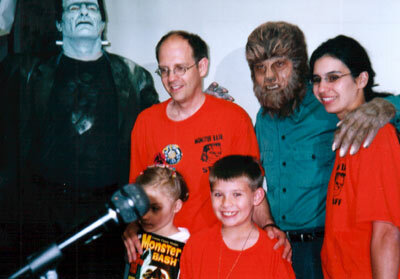 Now Photos from Monster Bash 2005 - CLICK HERE!